We are Anne and Tony Sutherland-Smith from Australia, travel bloggers at Pretraveller. 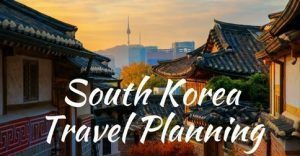 We are booked in to visit South Korea in September 2018 so decided to set up a dedicated website to share our planning for our trip, as well as to help others to plan their trips to South Korea and to share our experiences after we return. We have previously visited Japan and found that it was quite challenging to work out how to get around and what to do, and expect to have a similar experience in South Korea. Our travel style is for mostly independent travel, with some half day or day tours included. Our overall travel philosophy is that ‘half the fun is getting there’. We are also setting up an email list to help people travel to South Korea – subscribe below to receive our periodic newsletter which includes travel planning information for South Korea, latest deals as well as a selection of the most popular articles from the Facebook Group. You can also receive additional emails to help you plan your trip to South Korea, as well as our pre-departure checklist to ensure you are ready to depart! If you use Pinterest you should also follow South Korea Travel Planning on Pinterest.